To round off a successful year, the band had the privilege of being asked to play again for the fourth annual Crook Morris Christmas Ceilidh in the Kendal Parish Hall. The band were again augmented by a brass front-line of trombone, alto and tenor saxophones, and this helped to create a very special atmosphere. The photo on the right shows the brass front-line consisting of, from the left, Heather on trombone, Jennifer on tenor sax, and Kathleen on alto sax, with Steve looking on whilst feeling the groove. For the Files Schottische dance, the band played their version of the carol Little Town of Bethlehem, and they can be heard playing here. The stephop dance Tumbling Tom's Tonic was specially written for the band, and for this dance we played our arrangement of the song Mary's Boy Child which can be heard here. Entertainment was provided by Crook Morris and the Kendal Revellers. 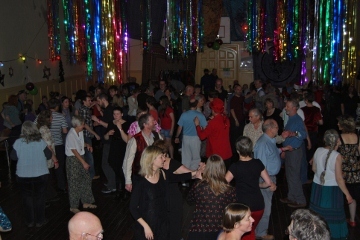 Crook did three dances, Rapper, Border and Cotswold, and the final section was Crook's own Cotswold dance called 'A String of Pearls' written to celebrate 30 years of dancing. The Revellers sang six sings in two spots, with two of the six songs being the West Midlands Wassail, and a version of Whilst Shepherds Watched known as Langsett, to which Juliet and Martyn danced a Bampton style jig. You can hear both of these songs here, and see them singing the carol Hail Chime On here. One dancer said after the event that the evening was the best yet, and certainly from the bands perspective it was an absolute joy. Our sound man for the evening was Fiona's husband Pete, who besides being an excellent musician in his own right is also an instrument maker.This year both Fiona and Pete again visited the French music and dance festival at St Chartier, and picked up a new dance - a chapelloise. 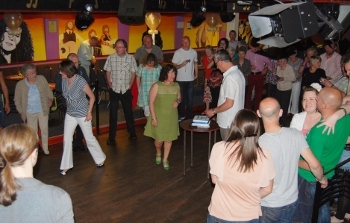 They introduced the dance to the receptive dancers, and the photo left shows Fiona and Pete demonstrating the progression. Not to be out done on the French theme, Les introduced a circular form bourree for 4 or 5 people, and the photo right shows Les in the red top hat walking through the dance with the dancers. The evening concluded with everyone singing 'We Wish You a Merry Christmas' led by Jenny and some of the Revellers. 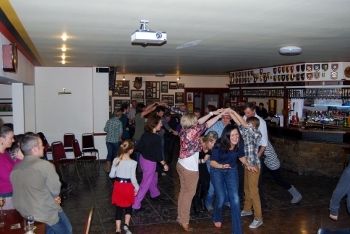 A new venue this month was Kirkby Lonsdale Rugby Club, where the club held a fund raising event. 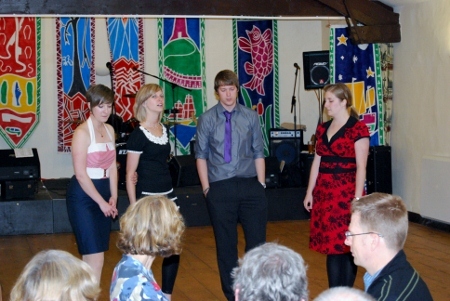 An enthusiastic group of dancers helped to make for an enjoyable evening. Thanks to Marcus and his team. Another regular venue for the band is the Netherwood Hotel at Grange-over-Sands, where we are the 'recommended' band. We started the month there with a birthday celebration for Hazel, and the wide range of ages helped make a very special evening. That was followed by a return visit to Hest Bank village hall for Diane's 50th birthday party and a great evening. 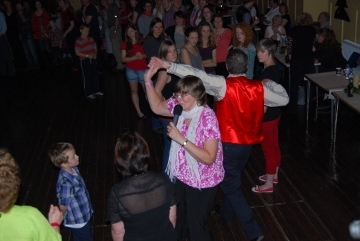 Below left shows Diane and her set dancing Strip the Willow, with our caller Les overseeing the fun, and below right shows the floor during the last dance of the evening. Thanks to Diane and her friends for a lovely evening. Diane said afterwards -Thanks again for a great night in September - guests still raving! 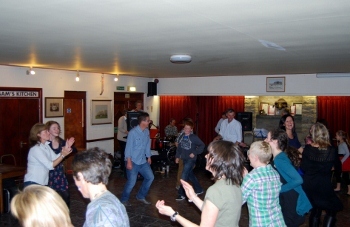 A regular venue for the band is the Coot at Great Urswick. Rebecca & Phil chose the venue for her wedding and a great time was had by all. They thanked the band afterwards saying - Thank you so much for a great evening of entertainment. You made our wedding day very special, and everyone said what a great time they had. The band's normal area of playing is Cumbria, north Yorkshire, and north Lancashire, but occasionally we travel further afield, and this gig was one of those exceptions. We drove down to Manchester for Hannah's wedding, and a good atmosphere made the long journey worthwhile. Our drummer and caller, Les, and his wife Hazel celebrated their joint 60th birthdays with a ceilidh at Bardsea Malt Kiln. 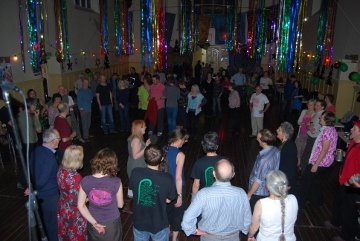 As well as dancing to Tumbling Tom, there were numerous entertainment spots including singing and playing from their 4 off-springs - right - and step dancing from Alex Fisher - below left - the nationally known dancer who started her dancing with the local morris side. 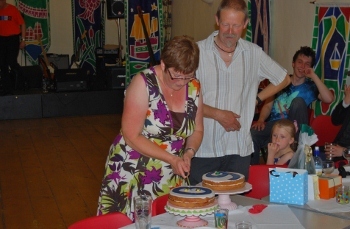 Below right shows Hazel & Les cutting one of their two cakes. The poor weather in the middle of the month put the May gala at Hest Bank at risk, but most of the afternoon activities managed to complete before the rain came. 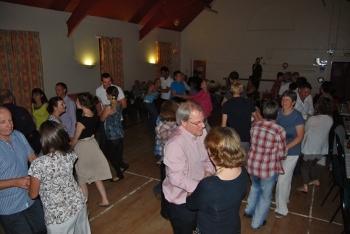 The band were booked to complete the day with an evening ceilidh in the Memorial Hall, and a great night it was with a wide range of people all of whom seemed to be up for enjoying themselves. Thanks to Joanne and her team for a great evening. 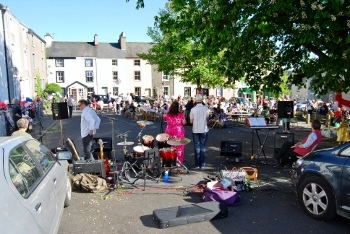 Its not very often that the band are asked to play in the open air, but the ceilidh on May Day was in the lovely square at Broughton-in-Furness to help the village celebrate both May Day and the royal wedding. The day was warm and sunny, but with a cool breeze, and lots of people enjoyed the great atmosphere. 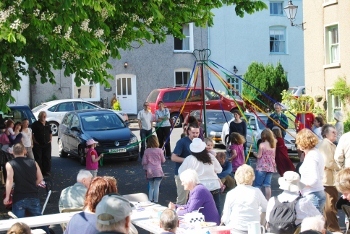 The photo below left shows the Maypole dancing with guest musician John Hazelhurst, and below right a view of the square from behind the band. Selwyn Wright said afterwards - Thanks a lot!! You were brilliant - just exactly what we wanted. The whole village had a wonderful time and at 7.30 we were still pulling the chairs out from under people! Please pass on our grateful thanks to your colleagues - you helped make it a day which will go down in Broughton's annals. I'm sure it will become an annual event and I shall be contacting you next spring. Sometimes people book the band for different occasions over a number of years, and the last booking of April was one of those. Sharon and Colin Miller had booked us previously for socials at Endmoor VH, but this occasion was to help them celebrate their 30th wedding anniversary at The Park night club. 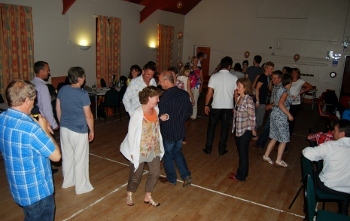 A good atmosphere and enthusiastic dancers made for a very enjoyable evening all round. The shot on the right shows Sharon and Colin about to cut their cake. 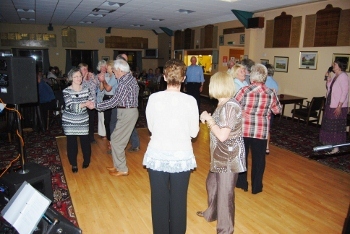 A new venue for the band was the Grange Fell Golf Club, where the Saturday night dance was a great success, with much laughter well to the fore. Thanks to Ellie and her team for a very enjoyable evening. 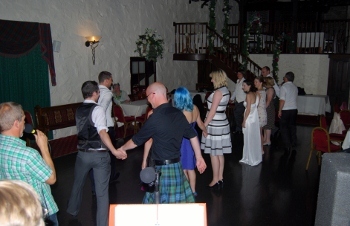 Ellie said afterwards - Just a quick note to say how much we all enjoyed the ceilidh on Saturday: everyone I've spoken to said what a great band you were. I must also say what a good Caller you had - very clear and good instructions...Hopefully we will see you all again next year. The band have been friends with Jane and Freddy Porter for years, so when they asked us to play for the wedding of their daughter Ellie, we leapt at the chance. 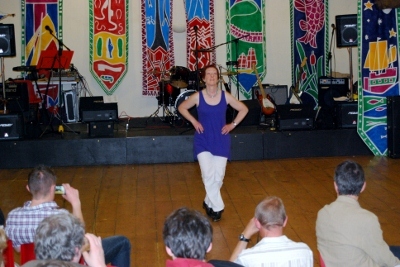 The event was held in Kendal Town Hall and the band had Martyn Harvey to call the dances. A lively evening with lots of dancers on the floor all helped to create a great atmosphere, and the band wish Ellie and Mathew lots of happiness for the years to come. Ellie and Mathew said afterwards - Just a quick card to say thank you very much indeed for making the ceilidh at our wedding reception such enormous fun. 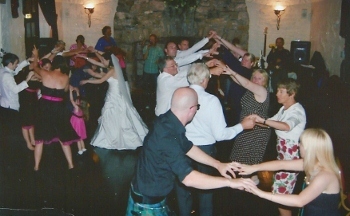 It was a complete success, and all of our family and friends said what a great time they had....When we got engaged and began to plan our wedding, one of the first things we agreed was to have a ceilidh at the reception. Tumbling Tom lived up to every hope and expectation. Right shows Ellie & Mathew at the church: below left shows Freddy and Ellie on the dance floori, and below right a view of the stage and the dance floor from the balcony. 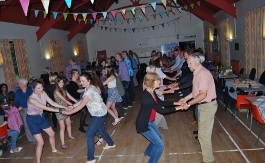 Stephen Colman is a regular attender at our ceilidhs, and he invited the band to play at the Casle Street Centre in Kendal to raise funds for Oxfam. It was a good night with lots of dancers, and raised lots of money for a worthy cause. A letter afterwards said - I should like to say thank you to the band for helping to make the event such a great success. Everyone enjoyed themselves tremendously and we were able to send off a sizeable cheque to Oxfam...We are looking at doing a simialr event next year so will be in touch later in the year. 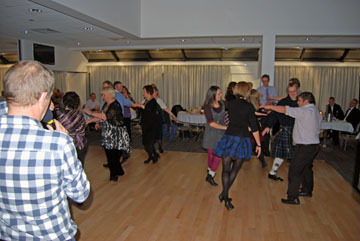 The first dance of the year was for a Burns night supper at the Globe Arena, the new home of Morecambe FC. 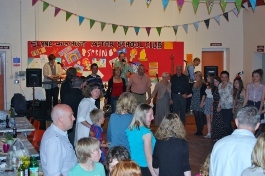 A new venue for the band, the evening was enlivened by some lively young dancers.